In Richmond,Charlottesville, Hampton Roads or northern Virginia and looking for a PA or sound system for your trade show, meeting, event or iPod wedding? Let AVIVA Rental Systems help you select the best combination of powered speakers, mixers and microphones (whether wired or wireless, hand-held, table top, lavaliere or headset) to meet your PA, audio and sound equipment rental needs. 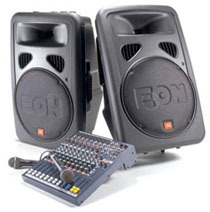 Call AVIVA Rental Systems at 804.353.9212 or e-mail our Event Director at doe@avivarentals.com today to discuss your microphone, mixer and speaker rental needs for your iPod wedding, next meeting or other event. Shure microphones' solid reliability and superior sound make them the standard bearers in the audio industry. From the standard Shure SM58 wired mic to the family of Shure ULX, SLX and PGX wireless microphone systems, AVIVA Rentals has a microphone solution for your event or meeting. AVIVA Rentals features JBL Eon 10" and 15" powered speakers, the most popular, premium-powered speakers in the AV industry, as well as the QSC K-Series (K for kilowatt) K8 and K12 audio loudspeakers, a new standard in lightweight powered loudspeaker systems. AVIVA also carries the JBL EON 518s 18" powered sub-woofer speaker and the QSC KW181 18" Active Subwoofer, both for when you need to pump up the jam. The Radial ProAV1 and ProAV2 are passive direct boxes specifically developed with the audio-video integrator in mind. To eliminate the need for various adaptor, a 'Swiss Army' array of connections are provided. including 1/4" for instruments, RCA and 1/8" connectors for consumer electronics and computers and a +4dB XLR input(s) for professional systems. Front panel connectors can also be used as thru-puts to allow multiple patch points. The ProAV1 is ideal for events that interlace audio with video where music sources can include iPods, CD players and video decks. The ProAV2 stereo version trades some of the connectivity features for it's full dual-channel stereo operation. Custom wound transformers are employed that are able to withstand exceptionally hot levels while maintaining linearity from 20Hz to 18.5kHz. The resulting smooth Bessel curve is warm and natural, making the AV1 particularly adept at handling digital sources that can sound harsh. Transformer isolation adds the benefit of eliminating ground loops that cause audio hum and buzz and video hum bars or snow. The EU2000i is also perfect insurance against power outages at events held during the spring and summer storm season! Don't cancel the party, rent a generator from AVIVA Rentals! Powered speaker and mic. Add audio mixer if music and voice are boh on the agenda.